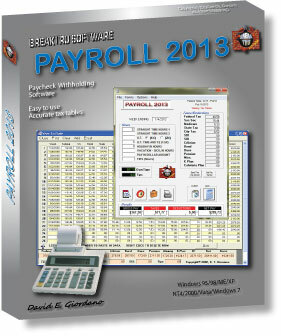 Payroll Software. Ever wonder if your pay check is correct? Are the deductions and withholding too much or too little? Payroll software makes it easy to keep track of your weekly or bi-weekly pay checks. Enter the hours worked as well as overtime, holiday, sick leave, and other pay categories, then Payroll applies the withholding tax rates for federal, state, and city or non-city resident based on your exemptions claimed and marital status. Print pay checks. Vary your K-plan deduction to see what percentage is right for you. Check medicare, SDI, SUI, Cafeteria Plan and social security payments. Print out (Excel or Text) year-to-date chart shows your week-by-week earnings and is updated with just a mouse click. The overtime chart saves your last year's pay periods and calculates overtime percentage, so that you can track whether you are pushing company limits. Unlimited employee. USA only. Accounting. Best, Easiest and cheapest small business Payroll Software available.